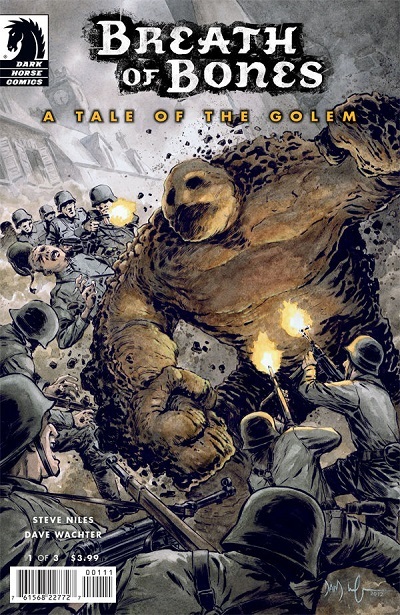 Over the years, Steve Niles has built himself a solid reputation as a producer of modern horror comics. So walking into Breath of Bones with those expectations, I was immediately caught off guard by what was presented in this initial chapter. Choosing to eschew internal organs strung up like Christmas lights, this particular tale has decided to add its own; injecting these humble beginnings with a whole lot of heart. As a young man by the name of Noah continues to bravely fight in the final days of WWII, he remembers back to his youth and how he wound up on the mud-strewn fields of battle. His father called up to arms from their sleepy European village, his days are spent waiting for the man who will never return, while his grief is tempered with the advice of his grandfather. But their relative peace is shattered one afternoon when a British fighter is shot down near their village. Desperately trying to convince the village to shelter the injured pilot, can Noah sway the others to put themselves in danger as the Nazi’s loom ever closer? What can a village made up of old men, woman, and children do to fend off their battalions if they do? And what is the secret that Noah’s grandfather has kept hidden all these years? Reading much more like a historical drama piece than the horror Niles is best known for, Breath of Bones has a real feeling of humanity as it explores the loss of innocence within its main character Noah. While simple in its execution, it is that very simplicity in the dialogue that allows the reader the space to become attached to this unfortunate child, and brings a sincere amount of empathy to his decisions. Those looking for the supernatural elements touted in the solicit will need to wait though, because while it is touched upon briefly, the main focus lies solely on introducing the more mundane cast in this initial issue. And personally, I believe it was the right decision to make. Adding the emotional gravitas to these characters at the outset should pay off in the long run as we get pulled into the dramatic and deadly war-front alongside Noah. The artwork provided by Wachter is more than solid in its execution. Providing both the chaos of the battlefield as well as the quiet emotions of a sorrowful young boy, Wachter is able to bring to the title a look that matches the deceptively simple story while adding the emotional overtones required to elevate it above itself. Extremely detailed in his backgrounds and expressive with his characters, it is a style that should read interestingly as the title starts to delve into its more horrific situations next issue. Give it a try. Those looking for another horror piece from Niles may be a little let down by the dramatic nature of this, but it is a very heartfelt and interesting story at its core. Next issue should start to bring the more fantastical elements into the story, and if melded properly with this chapter, should successfully add an extra layer of emotion on top of the supernatural war-torn chaos to come.